Have you ever been in a situation where you had multiple devices that needed to connect to the internet, but only one available source (like an ethernet cable or cellular air card)? Sharing your internet connection is only a few clicks away. Although free WiFi access points are spreading like wildfire, let’s say you’re on vacation and the hotel you’re staying at only offers internet via a single ethernet port in the wall. It may not be a big deal if you’re traveling alone with one laptop, but you’re most likely staying with friends or family that have their own technology addictions to feed. So what are you going to do about this little situation where there are a mix of PCs, Macs, and iPhones clamoring for contact with the outside world? Patiently take turns? Ha! Good luck relaxing on that vacation. 1. 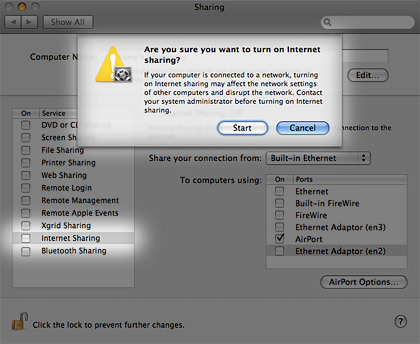 Open System Preferences and go to the Sharing pane under the Internet & Network heading. 2. On the list of services to the left, select Internet Sharing. Don’t check it quite yet — there’s a few options that need to be set first. 3. 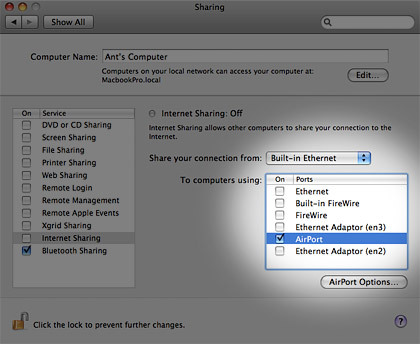 Depending on what your current internet source is, select it from the menu next to “Share your connection from.” As you can see below, I chose Built-in Ethernet since that is how my Mac is getting online at the moment. 4. In the “To computers using” box, select and check AirPort from the list. 5. While it is not required, it’s generally a good idea to lock down the WiFi hotspot you’re creating with a password just in case unwanted visitors are tempted to steal your bandwidth. Click on the AirPort Options button to configure these security settings. 6. 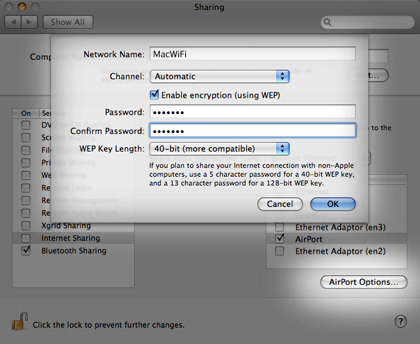 In the window that pops up, type a basic Network Name and check the “Enable encryption (using WEP)” box. Enter an easy to remember (but not easy to guess) password in the boxes below. Remember you will have to provide this password to anyone you want to have access to your Mac’s shared wireless network. Click OK.
7. The configuration portion is finished, so the only thing left to do is check the box next to Internet Sharing and enable it. A confirmation message will appear — click Start to complete the process. Now that your Mac’s internet is being transmitted from your AirPort WiFi card to other devices, you should see an icon like the one pictured at the very beginning of this tutorial in your menu bar. If you do, you’re in business! Virtually any tech gadget with built-in wireless networking (including Windows PCs, iPhones, iPod touches, PSPs, and of course other Macs) should be able to connect successfully when the security password you set is entered. My iMac doesn’t show the ‘Airport’ icon… why is that? It works great for me. Cheers………..!!! I am using a prepaid dongle in my imac what do I select from the list of “share your connection from” menu??? tried to set up a hotspot on my Mac for the first time today. 2) only security options offered are “none” and WPA2. 3) HERE’S THE KICKER. the WPA2 option requires a 13-character password. except that it doesn’t tell you that anywhere in dialogue box. so if you’re wondering why your “OK” button isn’t lighting up after you’ve entered and confirmed a pass word, make sure you’re password is exactly thirteen characters long. My building provides Wifi but I can only access it from certain parts of my apartment. I want to share my Mac to share the Wifi to my ethernet cable to my own Wifi router. But when I hook it up, my computer says the Ether connection is connected but the router is not broadcasting internet. Is this a settings issue? Thanks! i have a ibook macintosh. um i have wifi..enabling me to pick up others internet but i would like to some how download something to make my laptop a sorta hotspot is that even possible? Thanks, that is my situation exactly: vacation apartment with a TWC “bundle” but wifi is simply not working. Spent half an hour on hold with them and gave up; tried to get into the cable modem’s login but it was not default pw. My Mac Book works with the CAT5 cable that was still in the bag left next to the modem, but 3 other devices in the family are wifi only. I looked for a hotspot app to no avail; glad to know it is built in! Just have to know where to look. I do wonder about the WEP only though. Why not more up-to-date security? BTW, the wifi 2.4GHz band is very crowded here in a Manhattan apartment! But the 5GHz band is empty. I wanted to point that out: on the details you can pick the channel, and there is a split dividing channels from the two bands. The 5GHz band is often not used, or in any case use a wifi scanner to find the best place to set up your own. thank you very much. works like charm. what a tips. dude, thanks so much for posting. this worked like a dream, immediately. hi, can i share my Mac’s wi-fi to my iPhone? no, it’s not crazy, i paid for Boingo wi-fi access and they charge extra to connect additional devices. I use MacBook Pro 15″ Core 2 duo with Mountain Lion OS. my problem is that I can’t find the option of “Airport” on the Internet Sharing. Please how do I go about this in other to set my mac Hotspot. Thanks. Thanks a ton,it worked like a breeze!!! I’ve been using SHARING for a few years. This morning I wanted to use WEP and I set up the password. iPhone running 5.1.1 works flawlessly, but the Nexus 4 will NOT connect. If I stop using a password, it WILL connect. Anyone know WHY the Nexus 4 will not connect when WEP is enabled? And would anyone know how to fix it? The “Share Your Connection From” box is unavailable. As in im not being able to click on it. Why? Work flawlessly on iMac with Snow Leopard, to give wifi connection for Blackberry. I’ve tried this several times with and without WEP security. It allows my Mac Mini to act as a hotspot but stops the internet working on the MAC! I tried setting Ethernet at the top of the Order Preference, followed by WiFi but this didn’t sort it. It works. Thanks. I have been looking for this facility in my Mac for long, thanks to this site who served well. works great.. this what i was looking for.. thanks to apple..
in the part ( to computer using ) I dont have an airport choice ! only ethernet and firewire ! what should I do ? Thanks very much. with Maverick I barely chose Ethernet, share with WI.FI to be able to connect on ipad and iphone. Luck to you all. I am able to establish the connection successfully in my macbook pro OSX 10.8.5 by this method. But i am not able to access the internet from my iPhone 5s. The browser says i am not connected to the internet. Can anybody help?? amazing this is just brilliant…. u saved my life…. thank u so much mate…. I use MacBook Pro i5 13″ Mid 2012 with OS X 10.9.4. my problem is that I can’t find the option of “Airport” on the Internet Sharing. Please how do I go about this in other to set my mac Hotspot. Thanks. Thanks for your support. But I am facing the problems in running some app on android like play store, youtube and chrome. Although watapps, facebook and etc are running g8 but these three apps are not running. plz help. showing reload page. Is there any way to hide the SSID(hidden network). I don’t want others to see my wifi name. for all those using new version of OS (OS 10.9 OR later) instead of Airport option they show wifi option. try this..
tick the box for’ internet sharing ‘ again…then a popup window will appear then click start. note: save a password more then 8 characters…in some system they don’t show the number of characters. I can successfully share my wifi with other devices. But it is not secured with WPA2 Personal. I set the 13 digit password on “Configure an Internet Sharing” section. But the device was not asked for any password. It directly connect with my mac mini. What should i do. On step 4, what if Airport doesn’t show up as one of the options? Does the iPhone USB option mean I have to connect my iPhone to my MacBook Pro (OS X Yosemite 10.10) with a USB cable if I want to use the Mac’s internet connection (from the ethernet cable) on my iPhone? Otherwise, thank you for being incredibly helpful! Hi there, I have a Mac running on OS 10.5.8 – but I don’t succeed turning on the internet sharing FROM this computer? it says that it is not connected to an Ethernet cable – but it IS ! wow man… Thanks a lot… it actually worked!! Why did I not find this website earlier! !